I lost by beloved Golden Retriever, Bud at only 8 years old to a hideous blood borne cancer when he was only 8 years old. The cancer was so aggressive, he went from feeling fine one day to passing only 3 days later. I wanted to honor him by rescuing another special Golden in need. 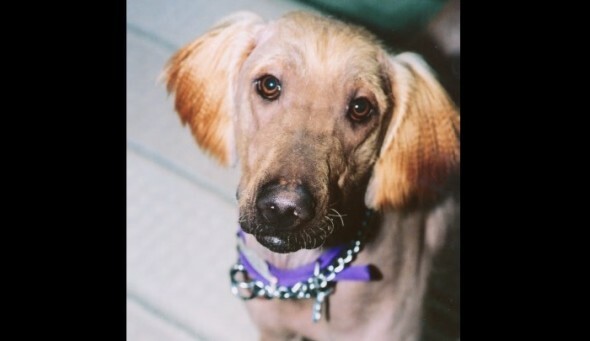 I was looking on the website of DFW Metro Golden Retriever Rescue when I saw her. She was one year old. She had a fleece coat on. She had sweet gentle eyes. And… she was completely bald except for the hair on her ears. She had a rare, one in a million condition called Folicular Dysplasia. I knew I had to have her. She had been at the rescue for 5 months, when the average time to be adopted was 2 weeks. When she was a puppy and her puppy hair fell out, her hair follicles closed up and adult hair never grew in. Her owners did not want her because of the way she looked. She was dumped at the rescue like a disposable life. I took Peanut home and she laid her head in my lap as if to say “Thank You” and fell asleep. I knew then I had the perfect companion. Peanut had a sweetness about her that rivaled no other. She truly was one in a million in more ways than one. I lost her in 2013 to bone cancer. She was 12 years old. Sweet Peanut enriched my life beyond anything I can put into words. I sure miss you, Girl! I couldn’t have asked for a more perfect dog. Thank you very much to The Animal Rescue Site for sharing this very beautiful and touching rescue story. To see it in it’s original form, click here. Wonderful story and thank you so much for adopting her! ! What a beautiful world if all of us will be animal lovers??? Right on the tears! But a truly beautiful story! You gave her a great life as well as the love and sweet memories she gave you in return. So, so hard to lose a Dog, you never forget that kind of unconditional love. How wonderful that she was adopted and life was joyful for both doggie and adoptive mum.